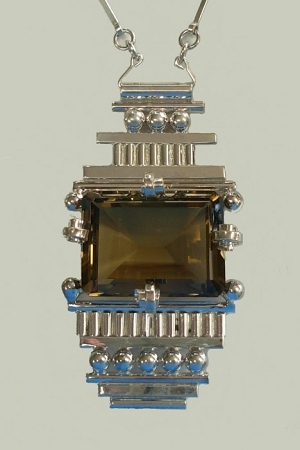 Art Deco Jewelry - This is a fabulous sterling silver geometric statement pendant that frames a beautiful emerald cut brown smoky topaz, smoky quartz. This limited edition handcrafted necklace includes a 24" handmade adjustable chain. Sterling Silver pendant with a faceted emerald cut genuine smoky topaz surrounded by a sterling silver design. This stunning piece of art hangs from a handmade sterling silver chain that is adjustable. Signed by Aaron Rubinstein and made by Modern Art Jewelry.